• defining limiting values of deformation, crack width, vibrations, etc. • showing that the limit states will not be exceeded in the design situations by using appropriate calculation models. The design values of actions and material resistances, as well as the load (action) combinations, are different for the persistent and transient ultimate limit states, for the accidental limit state and for the serviceability limit states. Although design by calculation is the most commonly used method of geotechnical design, the designer should be always be aware that knowledge of the ground conditions depends on the extent and quality of the geotechnical investigations. Such knowledge and the control of workmanship are usually more significant to fulfilling the fundamental requirements than is precision in the calculation models and partial factors. The calculation model may consist of an analytical model, a semi-empirical rule or a numerical model. EN 1997-1 does not prescribe calculation models for the limit states, but some sample models are given in informative annexes. Several examples of analytical models and semi-empirical calculation rules are illustrated in the examples of this guide. Note that not only analytical and semi-empirical models are recognized by EN 1997-1, but also numerical models (the finite element method, finite differences, etc. ), although they are not discussed further in the code. When no reliable calculation model is available for a specific limit state, EN 1997-1 permits the analysis of another limit state, using factors to ensure that the specific limit state is sufficiently improbable. This approach is commonly used in geotechnical design for checking serviceability limit states in a simplified way, when no values of deformations are required to be known, by using ultimate limit state models (e.g. bearing capacity models) with rather large 'safety factors' on loads (see also Section 2.4.6 in this guide). 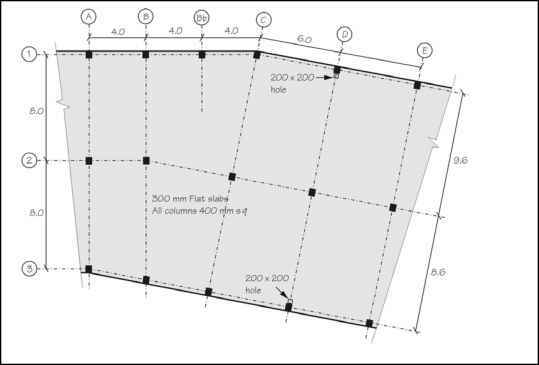 This method is applied for example in Section 6 by the 'indirect method' for checking the design of spread foundations. Calculation models often include simplifications, the results of which should err on the side of safety. It may happen that the calculation model includes a systematic error or that it presents a range of uncertainty. The results of calculations based on such models may be modified, if needed, by a model factor to ensure that the results are either accurate or err on the safe side. Model factors may be applied to the effects of actions or to resistances. The practical use of model factors is illustrated in several chapters of this guide. The characteristic values of actions must be derived using the principles of EN 1990. The values of the actions from the structure must be taken from EN 1991. EN 1997-1 is devoted to geotechnical actions on structures and to geotechnical resistances. Actions may be loads (forces) applied to the structure or to the soil and displacements or accelerations that are imposed by the soil on the structure, or by the structure on the soil. Loads maybe permanent (e.g. self-weight of structures or soil), variable (e.g. imposed loads on building floors) or accidental (e.g. impact loads). It is necessary to distinguish between actions imposed by the structure on the ground and geotechnical actions imposed by the ground because, in some Design Approaches, partial factors are applied to each of them differently (see the section on Design Approaches on p. 31 of this guide). An important principle when dealing with actions is the 'single-source principle' (see note 3 in Table A.1.2(B) of Annex A1 in EN 1990). This principle states that, if permanent actions arising from the same physical source act simultaneously both favourably and unfavourably, a single factor may be applied to the sum of these actions or to the effect of them. A typical example is water pressure acting on both sides of a retaining wall when the water is from the same hydrogeological formation; the effect of the water pressure on the active and passive sides of the retaining structure is therefore calculated using the same partial factor for both sides (see Example 9.2). EN 1997-1 stresses that ground properties must be obtained from results of tests or from other relevant data. Such data might be, for example, back-calculations of settlement measurements or of failures of foundations or slopes. When assessing geotechnical parameters from test results, account must be taken of the possible difference between the properties obtained from the tests and those governing the behaviour of the ground mass and/or the geotechnical structure. A checklist is given of those factors that might cause these differences. One of the most important features to be checked is whether the ground shows marked strain-softening behaviour or brittleness. When the peak strength is exceeded locally, there is a dramatic loss of resistance, and redistribution of stresses might lead to further exceeding of the resistance of the ground, which may eventually lead to progressive failure. Section 2.4.4 of this guide provides further explanation. Clause 2.4.5.2(2)P • Step 2: from these, select the characteristic value as a cautious estimate of the value affecting the occurrence of the limit state, including all relevant, complementary information. All aspects concerned with step 1 are discussed in Section 3.3.3 of this guide. This chapter deals with step 2. • limit state - the selected value must relate to the limit state (this is discussed further in Chapter 3).